Unfold your own Myth! In a previous post I talked about moving toward the best version of myself, which feels like the unfolding of my own myth. The only way that I know how to move toward that best version is to allow my own myth to unfold. And the only way that can happen in my life, is to create a sacred space with intention. I’m in awe – this is mine! This will be on my own book! I feel – no – I know that I am being led, that my myth is unfolding perfectly. One of the most beautiful ways to understand the essence of Spiritual Direction is that you enter into a dialogue with the intent of letting your spirit reveal to you the story you are living that is your life. I am humbled as I engage in this dialogue, as my myth unfolds. Caroline Myss’s new clip on You Tube, ‘Spiritual Direction’ is rich and full. It is long, but so worth the time. Please do take the time to listen. And take the time to create the sacred space to allow for the intention to unfold your own myth. I’d love to hear about how your own myth is unfolding. And as always, thank you for taking the time to visit. I appreciate it. I’ve written about PERMA in previous posts. In his study, Kaufman discovered that all five elements of PERMA were very strongly correlated with each other. People who tended to score higher on one of the elements (e.g., positive emotions) tended to score higher on the other elements (e.g., engagement, positive relationships, meaning, and accomplishment) and those who tended to score lower on one of the elements also tended to score lower on the others. You can get to know your character strengths by taking the VIA Survey. You have many different types of strengths. These can be skills, talents, interests or resources; however these strengths do not reflect the “real” you— who you are at your core. Only by understanding your character strengths can you know how special and capable you really are. Character strengths are the personality characteristics that make you authentic, unique and feel engaged. The VIA Survey of character strengths is a simple test that takes just a few minutes of your time and provides a wealth of information to help you understand your core characteristics. 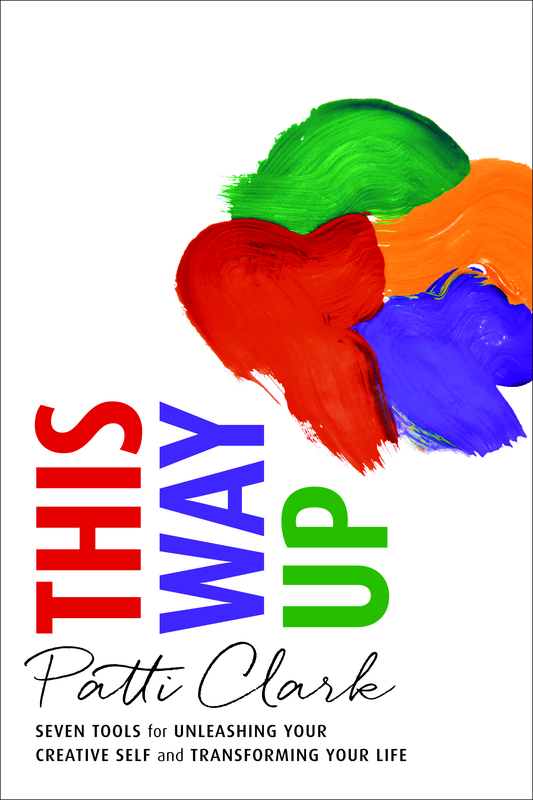 Created under the direction of Dr. Martin Seligman, the “father of Positive Psychology” and author of Authentic Happiness and Flourish, and Dr. Christopher Peterson, distinguished scientist at the University of Michigan and author of A Primer in Positive Psychology, this self-assessment character survey is regarded as a central tool of positive psychology and has been used in hundreds of research studies and taken by over 2.6 million people in over 190 countries. 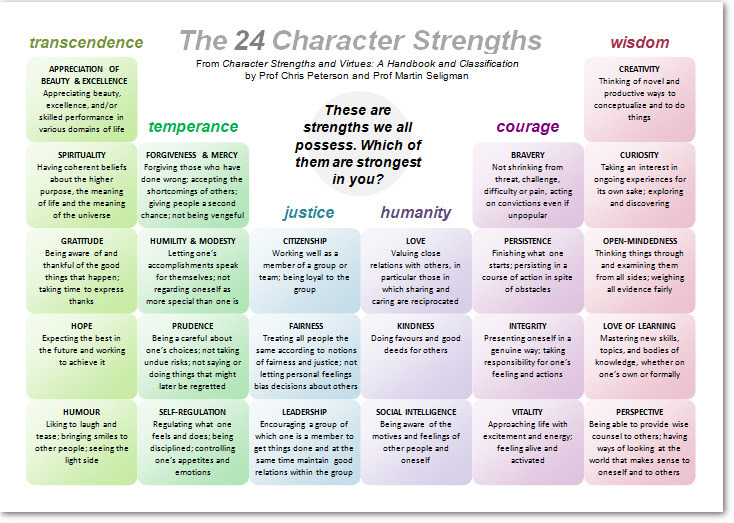 It is the only free, scientifically validated online character strengths tool available. It’s well worth the time to take the survey and learn more about what makes you feel engaged. But that The single best predictor of well-being was gratitude. So if you do seek well-being, (and honestly, who doesn’t?) your best bet is gratitude. I’ll close with a longer video, lasting almost an hour, but an excellent look at these strengths, called A Character Strengths Revolution. If you take the Signature Strength test, I’d love to hear about your experience. And let me know what you thought of the video. Positive Psychology is a popular topic on YouTube – there are several videos to choose between.